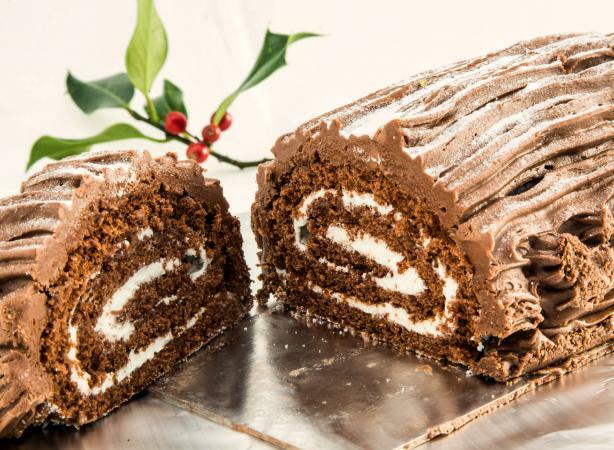 Bûche de Noël, or "Yule Log," the classic dessert served during the holiday season in Germany, France, and Switzerland, is a beautiful recipe that is not that difficult to make. A chocolate cake is baked in a jelly roll pan, then filled with whipped cream, rolled up, and frosted. 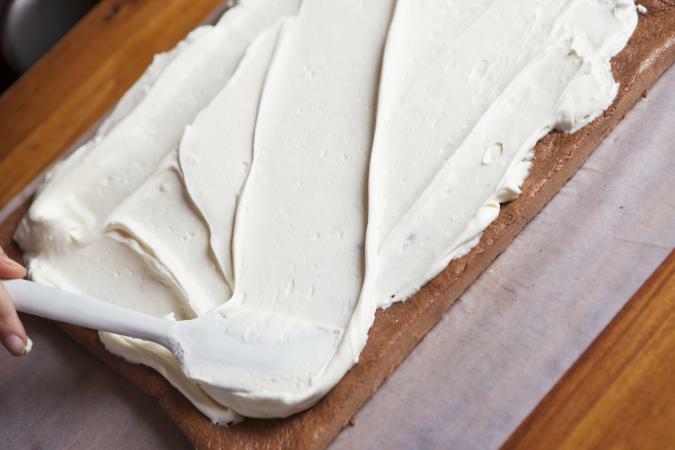 To make the dessert, you'll need to assemble ingredients for the cake, filling, and frosting. Preheat the oven to 375°F. Spray a 15" x 10" jelly roll pan with nonstick baking spray. Cut a piece of parchment paper to fit inside the pan and spray that with more baking spray. Set aside. Place a large piece of parchment paper on your counter and sprinkle it evenly with 2 tablespoons cocoa powder. 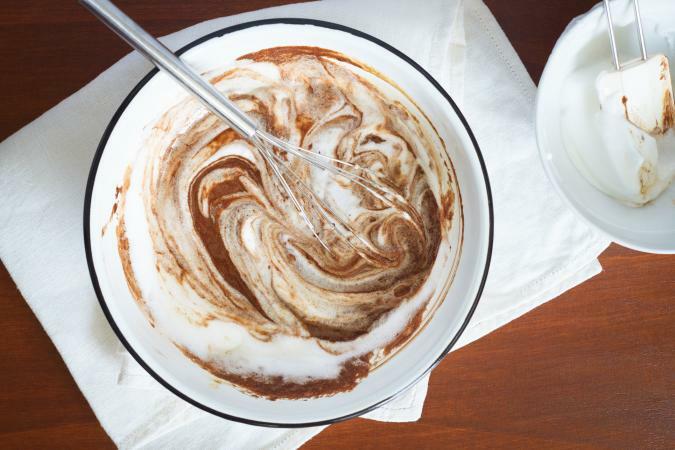 In a large bowl, beat the egg whites until foamy. Gradually add 1/2 cup granulated sugar, beating constantly, until stiff peaks form. Set aside. In a medium bowl, beat the egg yolks until they start to thicken, gradually add remaining 1/4 cup granulated sugar. Beat until the mixture is thick and lemon colored. Sift together the 6 tablespoons cocoa powder, flour, cornstarch, and a pinch of salt. Add the flour mixture to the egg yolk mixture alternately with the milk and 2 teaspoons vanilla, beginning and ending with the flour. That means you add a large spoonful of the flour mixture, beat it in, then add some of the milk and beat it in. Repeat. Fold in the beaten egg whites until they are combined, working gently. Pour the batter into the prepared pan, smoothing it out to meet the edges. Bake for 11 to 16 minutes or until the cake springs back when lightly touched. Do not over bake the cake or it will be difficult to roll. As soon as the cake comes out of the oven, invert the pan onto the parchment paper coated with cocoa powder. Carefully remove the pan and peel off the parchment paper that was in the pan. Gently roll the cake and the fresh parchment paper together, starting from the 10" end. Let the cake cool completely on a wire rack. While the cake is cooling, make the filling and frosting. For the filling, combine the heavy cream, vanilla pudding mix, 1/3 cup powdered sugar, and 1 teaspoon vanilla in a large bowl. Beat with an electric mixture until stiff peaks form. Cover and refrigerate the filling while you make the frosting. For the frosting, combine the butter, 1/2 cup cocoa powder, and 1/2 cup powdered sugar in a large bowl and beat well. Beat in a pinch of salt and 1 teaspoon vanilla. Then add the remaining 2 cups powdered sugar and enough milk to make a nice spreading consistency. To assemble the cake, carefully unroll the cake. The cake will not unroll completely, but will remain curved. Remove and discard the parchment paper. Carefully spread the whipped cream mixture over the surface of the cake. Roll the cake again, enclosing the cream. Using two large spatulas to lift it, put the cake on a serving plate. Frost the cake, leaving the ends exposed so the filling shows. Run the tines of a fork over the cake to mimic tree bark. If you'd like to add a stump to the cake, before you frost it cut off 1" of the rolled cake. Then press that slice onto the side of the frosted cake. If needed, add toothpicks to help secure it - just remember to remove them upon serving. Frost the stump and run the fork over it as well. You can decorate the cake using candied cherries and green marzipan leaves to resemble holly berries. If you work carefully and pay attention to the instructions, you will be able to make this beautiful cake. These things will help you in the kitchen. The cake is quite delicate, so handle it carefully. If the cake starts to tear or break, it may have been baked too long. Check the cake a few minutes before the time specified in the recipe. If it looks done and springs back, take it out of the oven. If the cake does start to break, keep going. You can cover any imperfections with the frosting. You can use canned vanilla frosting to fill the cake, and canned chocolate frosting to frost it. Flavor the whipped cream filling with 2 to 3 tablespoons cocoa powder for a completely chocolate Bûche de Noël. This cake is typically decorated with meringue mushrooms, and marzipan leaves so it looks like a log. Or you can pipe on berries and leaves using a pastry bag. Sprinkle the finished cake with powdered sugar to look like snow. You can reverse the flavorings: just omit the cocoa powder from the cake recipe and add another 1 tablespoon of flour. Fill this cake with chocolate whipped cream. If you don't have parchment paper, line the jelly roll pan with foil. Use a clean kitchen towel to roll the cake. You can make an easier version of this recipe. Instead of rolling the Yule Log cake, cut it crosswise into 4 sections. Stack the sections with the whipped cream filling. Frost the cake and decorate. This beautiful cake is a classic to serve at Christmas, and it will really impress your guests. Only you need to know how simple it is to make!